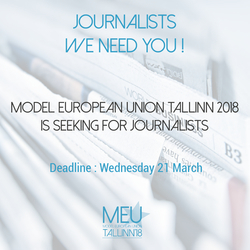 Model European Union Tallinn is looking for Journalists for new edition of their #ModelEU conference. The journalists will have the chance to write articles, take pictures and record interviews with the support of the Journalists Coordinator who will also play the role of Editor-in-Chief during the simulation. Furthermore, during press conferences, the journalists have the challenging opportunity to find key trigger points of the past discussions in the Councils/Political Groups. In this way, they also challenge the participants (who are either ministers or MEPs) to diplomatically explain their decisions and conclusions made within the work of the respective body.